Coastal Tourism – Underappreciated and Undervalued!? For much of the past half-century the story of the British seaside holiday and of traditional seaside resorts has been one of slow but inexorable decline, as many established UK coastal destinations found themselves out of favour and out competed by continental destinations on service, price, and average hours of sunshine. More recently, however, there has been a new narrative, where growth in the domestic coastal tourism sector is good and where efforts to reimagine and rebrand traditional coastal resorts and change public and media perceptions are gaining traction exemplified by a succession of articles in Sunday supplements proclaiming the ‘renaissance of the seaside’, ‘coastal cool’, or the virtues of traditional seaside fun. Increasingly confident, the coastal tourism sector is now worth an estimated £8 billion a year to the UK economy and sustains some 210,000 jobs making it bigger than the telecommunications industry and the motor and railway industries combined. With its specular designated coasts, rich natural and cultural coastal heritage, host of maritime attractions and diversity of seaside settlements from quant fishing villages to vibrant coastal resorts, it is no surprise that the South West is the most popular coastal tourism destination in the England and Wales accounting for 40% of domestic overnight seaside trips. 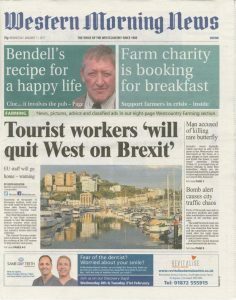 The South West too has, by some margin, the largest number of jobs directly supported by seaside tourism: 68,000, a figure that continues to grow across the range of resorts, but is particularly notable in many of the region’s fashionable, smaller coastal towns. Coastal tourism, then, especially in the South West, is on the up and doing well – but it can do much better. Nationally, seaside tourism has regained its position as the largest domestic overnight holiday sector, but growth in tourism employment has not been replicated to the same scale on the coast. Coastal tourism continues to face significant competition from the city break, and a range of other challenges relating to staff recruitment and retention, adaptability to short-stay trends, and a persisting lack of awareness about what the coast can offer as a tourist destination, particularly among the under 35s and international visitors. Coastal tourism, therefore, remains under appreciated, undervalued and has significant potential for growth. National Coastal Tourism Academy (2016): 2016 Coastal Tourism: Summary Report of Challenges and Opportunities for Growth. Convening at the Devon Hotel in Exeter early in the New Year, this winter’s DMF conference focused on the theme of marine and coastal tourism. We examined the numerous opportunities and challenges associated with growing the marine and coastal tourism sector in our county and region. We explored how and where we can work together to change perceptions, raise awareness and promote the value and virtues of our magnificent coastline, and we considered how we can ensure that growth in the marine and coastal tourism sector is sustainable, appropriate and considerate of our single greatest asset and attraction – the natural and cultural/historic environment. We heard from a broad range of key coastal tourism industry policy and delivery professionals operating at the national, regional and local level including speakers from the National Coastal Tourism Academy, British Hospitality Association, Visit England, Visit Devon, Visit Plymouth, the English Riviera BID Company, the RNLI and the Sustainability and Surfing Research Group at Plymouth University. As with previous DMF events our Winter17 Coastal Tourism Conference also provided a unique opportunity to meet and network with members of the largest cross-sectoral marine and coastal partnership in the region.